Our vision is to actively cultivate increased physical dexterity and mental acuity for our flow meditation students in an effort to facilitate euphoric states and a sense of oneness. Temple of Poi classes are developed with this holistic journey in mine. 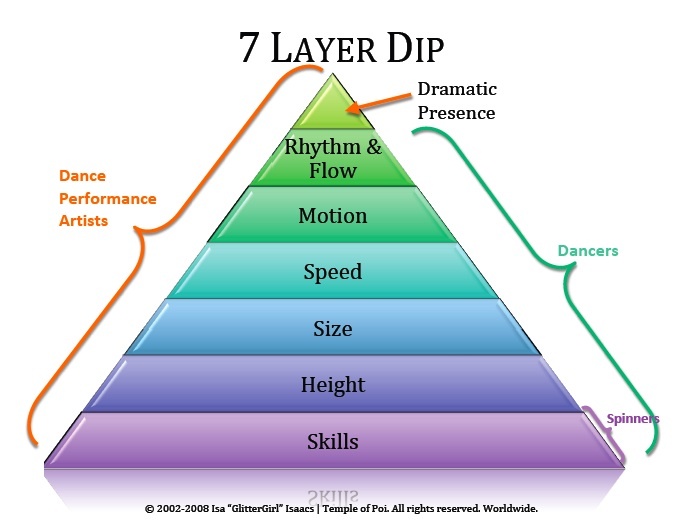 To support improvements in the physical skills of the flow arts, we offer comprehensive structures, drills, models, and distinctions which continually deepen the artists relationship to their flow tools. As the art form matures, we evolve our curriculum, continually affording student diverse material to study. At the same time, our classes educate beyond the technical focus and continually encourage development of a powerful and positive mindset. Integrating this mindset deepens our understanding of Self, yielding greater confidence, compassion, grace, positivity and acceptance practitioners experience within their flow practice (and life). As artists develop these attitudes, they release tensions and stress while increasing openness and access to flow. Increased access to flow accelerates the rate of learning, boosting confidence further. Through practice, this flow rEvolution cycle repeats endlessly, allowing artists deeper understandings, increased flow, never-ending learnings and the ability to create and surrender Self to euphoric states of expression. Just as we facilitation evolution for students, we have also evolved, expanding Temple of Poi class choices. With nearly 30 poi classes alone, we offer a roster designed to help flow artists deepen their practice and skills. We intentionally keep class sizes small so each student receives the personal instruction they need to continually grow. We create a supportive environment by inviting everyone to embrace the Flowology Mindset(tm) which encourages everyone to relax and enjoy their individual experience, no matter what it is like on a given day. Classes are designed using a consistent developmental model for each class. Each class offers new information as it relates to the model to help students gain a deeper understanding of their skills. Through this model, our classes teach the structure of a move so students also understand how to create moves like the ones they learned in their class, thereby reducing their learning curve. While developing their technique, Temple of Poi offers classes to help students develop artistic skills and style which uniquely define them as individuals. Our vision encourages artists to explore flow arts as an empowering practice. The practice can be an exploration of the physical, mental, spiritual, meditation, technique, primal, archetypal, fire, performance, artistry and especially some combination of them all. Our community inspires diversity of expression, learning and being. This includes sharing ourselves courageously by teaching and learning from others. We believe our overall approach ripples from individuals into community and is the core of theflow rEvolution.